Acquired by Littelfuse in 2017, U.S. Sensor Corp.® manufactures a complete line of custom probe assemblies. 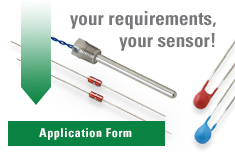 Our experience with thermistors and RTDs, coupled with our extensive testing of probe assemblies, makes Littelfuse the only logical choice for the manufacture of your custom probe design. a constant or intermittent wet environment. No matter how well, or deep, the thermistor or RTD is potted, under the above conditions the probe can be subject to moisture intrusion. While moisture intrusion does not typically cause the temperature sensor to fail, attempting to make a resistance measurement in a wet environment can allow the conductivity of the moisture to become a significant portion of the resistance reading. This creates a false reading at the measurement device. Littelfuse has developed sealing methods that prevents the moisture intrusion condition from occurring. Our proprietary processes have been proven reliable in many applications. Our probe designs have also been subjected to environmental, electrical, physical testing to prove the longevity of the design. Below is a typical Qualification test for a probe design. Thermal shock 10 cycles -40 to 180°C (Minimum 30 minutes at extremes and maximum 30 minutes between temperatures). Thermal soak 100 hours at 140°C and 80% of the rated max current. The probe on the right experienced the Qualification Tests described above. The brass has become significantly tarnished, however, the average temperature drift was less than 0.03°C.